Last week, Termite and I fished three days straight and my hands were hurting from so much fishing and so much fish cleaning. This week, we took a break from fishing and tended to other necessities. But when I woke up in such a foul mood today, I knew there was only one thing that would improve my disposition–a fishing trip. Off we went to our favorite winter lake. But the weather today was far from “wintry”. With the temperature around 70 F and the wind barely blowing, it was like a spring day out there. Absolutely gorgeous . . . 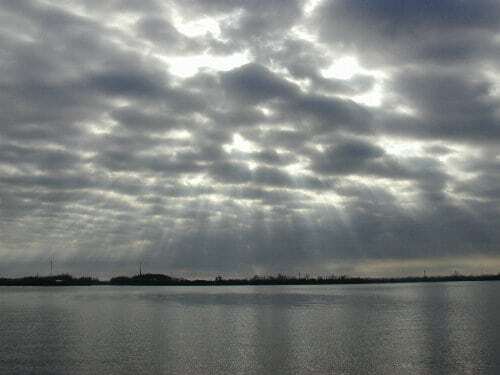 This is how the sky looked when we first arrived on the lake. The water was looking very, very fishy—just the way I like to see it. Not long after we settled into a fishy spot, Termite worked his fisherman magic . . .
Look! His shirt is color coordinated with the sky. What a kid, huh? The clouds have lifted and the sun is shining and all is well . . . 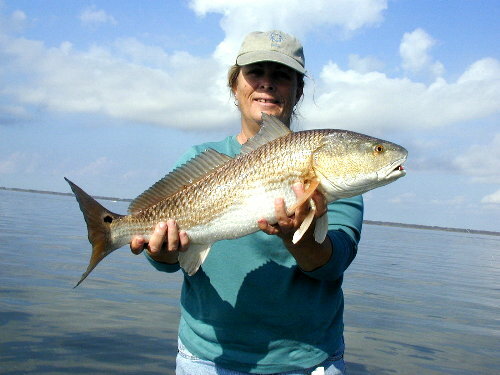 I wasn’t expecting to catch a redfish, so I was a little surprised when line kept spooling off my reel! This 26-incher put up quite a fight. 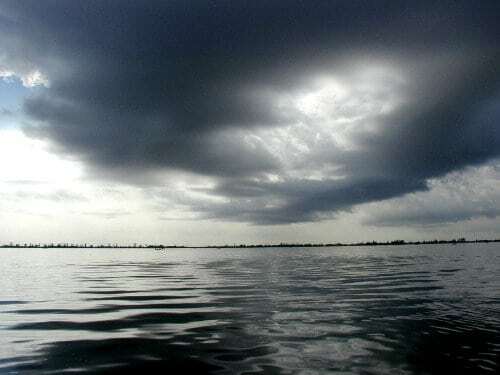 Soon after, the bite slowed down, the sky changed . . .
We decided to call it a day and head on home. Don’t worry! I haven’t forgotten about our NAME THIS PHOTO CONTEST! Right now, I have to go clean fish, so, tune in this evening after I’ve gotten all cleaned up! Post Script 7:35 p.m. After catching up on a little blog reading, I decided to pan sear some of those fresh trout fillets using Katybug’s recipe for “pecan meal”. I am eating it now, and man oh man is it good! Those are little cherry tomatoes cooked in the butter glaze, and I made a side of fresh guacamole. “Cuz Wendy….about the pecan meal for your fresh catches. Grind up pecans into a meal consistent to corn meal, maybe a little coarser. Then add a little flour and if you wish, a little corn starch. I find that enhances the crunch factor. What you want is mostly pecan meal. Season all of it with pepper and salt. This is perfect for your pan searing as you don’t want to burn the pecans. It’s best to use butter with a little oil. After searing the fish on both sides, remove them to a warm oven. In the same pan put in a little fresh lemon juice and butter until the butter starts to brown. Really beautiful photos, and great catch. THANKS FOR BROWSING, SHERWIN, AND THANKS SO MUCH FOR THE COMPLIMENTS. I PAID YOU A RETURN VISIT. COME BACK SOON, OK? I WOULD LOVE TO TAKE YOUR PRE-BRIDAL PHOTOS, DARLING. IS THE MOTHER OF THE BRIDE ALLOWED TO DO THAT? 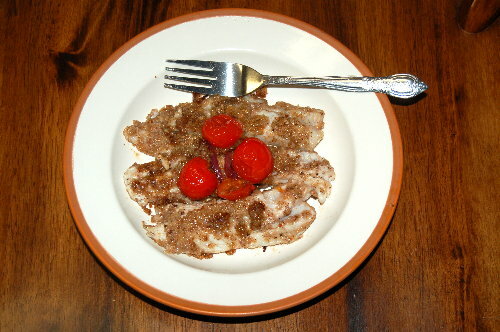 Oh, and also, sans cherry tomatoes, that pecan trout looks quite fabulous! IT WAS FABULOUS! AND WHEN YOU MOVE HOME, I WILL COOK YOU SOME! 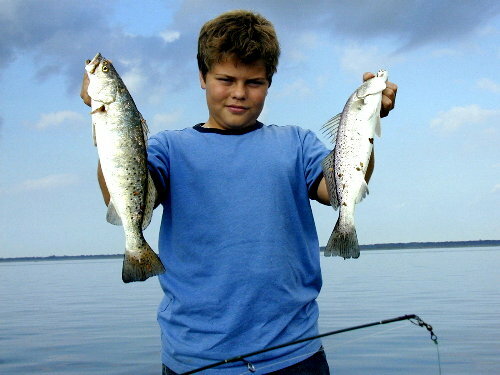 Boy you did a great job with those trout! And I love the cherry tomatoes as a finishing touch. I’m happy to know you tried it. Thanks for editing my typos. THANKS FOR BEING SO SPEEDY WITH THAT RECIPE. IT WAS REALLY, REALLY GOOD!!!!!! !